Man oh man have we been excited about this dinner party! I LOVE Pride and Prejudice and Jane Austen in general (along with the rest of the world) and when we started with these dinner parties, I knew this was going to have to be one of them. Plus, Rikki was reading Pride and Prejudice for the first time, so it was extra special! 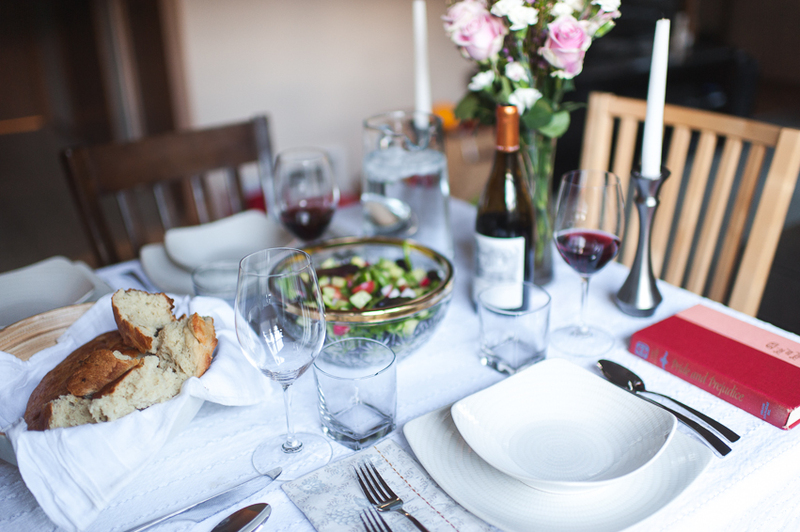 If you've followed along for a while, you know we love to capture the mood and scene of our books on a Pinterest board, and build a simple dinner party around the novel we've chosen. We generally get together in the late afternoon with our kiddos, set up our scene, enjoy dinner and lively book discussion together, and finish by watching a film version of whichever book is on the menu that week. Of course, for this novel, we had to go with easy elegance and quasi time period appropriate food ('at least three courses!' cries Mrs. Bennett in my head), with feminine florals and Austen-esque accents. We brought out a while linen table cloth and fully laid out proper place settings, accompanied by a vase of pink and white roses with touches of wilder wax flowers peeking out, all framed by long white tapers set in pewter candlesticks. Rikki baked a beautiful round loaf of bread to accompany some "white soup" mentioned in the novel, using a recipe she adapted from this amazing cookbook! After bread and soup followed a simple garden salad, a roasted chicken with root vegetables, and steamed rice. The great thing about this kind of food is that it's simple and not at all difficult, but looks impressive and tastes even better. After we recovered from stuffing ourselves with delicious dinner and laughing at Mr. Collins, while imagining what it would truly be like to attend a dinner party in the Austen universe, we took a break for some movie time, and rounded out our dinner party with a full tea service. I had dipped strawberries in chocolate and made scones and meyer lemon bars with my 3.5 year old (who loves helping in the kitchen) earlier in the day, so we simply made a nice pot of Earl Gray tea and set out lemon curd, grapefruit marmalade, and of course, clotted cream. We've said it before, and we'll say it again: it is so, so worth it to spend a few minutes of effort to create these dinner parties and have a magical atmosphere that pays proper homage to these great works of literature as we discuss them together. If you've missed it, we've done Little Women, Jane Eyre, Wuthering Heights, and The Awakening so far! It's been such a fun tradition, and we, again, cannot recommend it highly enough. Seriously, give it a try it for yourself! Whether you have a bunch of friends, just one, or it's just you, let us see your creation by using #theardentbiblioreads or tagging us @theardentbiblio!